The study of dynamical processes at the sea surface interface using infrared image sequence analysis has gained tremendous popularity in recent years. Heat is transferred by similar transport mechanisms as gases relevant to global climatic changes. These similarities lead to the use of infrared cameras to remotely visualize and quantitatively estimate parameters of the underlying processes. Relevant parameters that provide important evidence about the models of air-sea gas transfer are the temperature difference across the thermal sub layer, the probability density function of surface renewal and the flow field at the surface. Being a driving force in air sea interactions, it is of equal importance to measure heat fluxes. 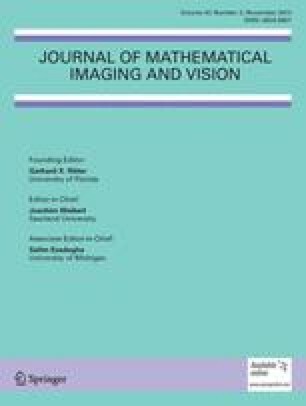 In this paper we will present algorithms to measure the above parameters of air-sea gas transfer during night-time and show how to combine physical modeling and quantitative digital image processing algorithms to identify transport models. The image processing routines rely on an extension of optical flow computations to incorporate brightness changes in a total least squares (TLS) framework. Statistical methods are employed to support a model of gas transfer and estimate its parameters. Measurements in a laboratory environment were conducted and results verified with ground truth data gained from traditional measurement techniques.